Diabetes mellitus is clinically and genetically an heterogeneous metabolic disease characterized by abnormally elevated blood glucose levels with dysregulation of carbohydrate, protein, and lipid metabolism. Recent theory suggests that the glycosylation of immunoglobulins in uncontrolled diabetic patients renders diabetic patients more susceptible to infections with hyperglycemia the primary cause for continuity of diabetes. Diabetic patients are prone to a higher risk of developing opportunistic infections, one such being oral candidiasis caused by the commensal organism Candida. The candidial density has also been reported to be higher in diabetes mellitus than in non diabetic participants. Although saliva provides efficient antibacterial and antifungal activity, mucins and other specific agglutinins tend to cause the aggregation of microorganisms. Changes in salivary flow impact antimicrobial proteins and enzymes in the saliva, potentially increasing the risk of colonization and secondary infection. Candidial counts were observed to be higher in patients with low salivary flow rates as well as in patients exhibiting a poor glycemic control. According to Stehr et al., certain gene expression (LIP) has been detected in oral candidiasis which plays a major role in localization of infection with their maximum activity found at pH of 7 and with a maximum growth at 72 h. Virulence factor that contributes to the process of pathogenicity is the hydrolytic enzyme, such as secreted aspartic proteinase, which is produced by Candida species. Tsang et al. have stated that the enzymatic activity of Candida albicans isolates obtained from type 2 diabetes is much higher than normal patients. Adherence of Candida to host tissue is the first step, and the enzymes facilitate the adherence by damaging cell membranes. Apart from these, the salivary proteins such as mucins and statherins also act as adhesion receptors used by the mannoproteins present in Candida species which is seen the saliva of diabetic patients favoring the growth of Candida. Outpatients visiting the Department of Oral Medicine and Radiology, who were under the age of 35–65 years with a history of diabetes for the past 5–7 years under medication, were included in the study. Patients with any known history of other systemic disease or conditions or with oral ulcerations, history of any antibiotic/steroid therapy, usage of any antiseptic mouthwashes from the start of the study, and denture wearers, smokers, and alcoholics were excluded from the study. Informed consent was obtained from all the patients and the study was conducted following approval from the Institutional Ethics Committee of the respective institution where the study was conducted. A total of 75 patients were divided into three groups based on glycated hemoglobin values (American Diabetes Association Glycemic Targets: Standards of Medical Care in Diabetes – 2018), Group I, Group II, and Group III, each comprising of 25 patients. Group III – 25 patients – Control group: Non diabetic participants with normal range of blood glucose level (postprandial blood glucose). % glycohemoglobin (GHb) (% hemoglobin A) = Absorbance GHb/absorbance total Hb × factor (4.61). Conversion chart is used for obtaining values from glycosylated hemoglobin A1% to glycosylated hemoglobin A1c (HbA1c) %. Saliva was collected from all three groups. Each patient was allowed to rinse the mouth with distilled water to remove any food debris. After rinsing the mouth 60 s thoroughly, the patient was asked to expel around 3 ml of saliva into a sterile container. Saliva was collected between 9 and 11 am and the samples were transported to the laboratory within 1 h.
The sample containing saliva was taken with 3.26-mm internal diameter inoculating loop, which holds a drop of saliva. Onto the Sabouraud's dextrose agar plate, drop of saliva was spread in a line across the entire plate crossing the first inoculum streak numerous times to produce isolated colonies. 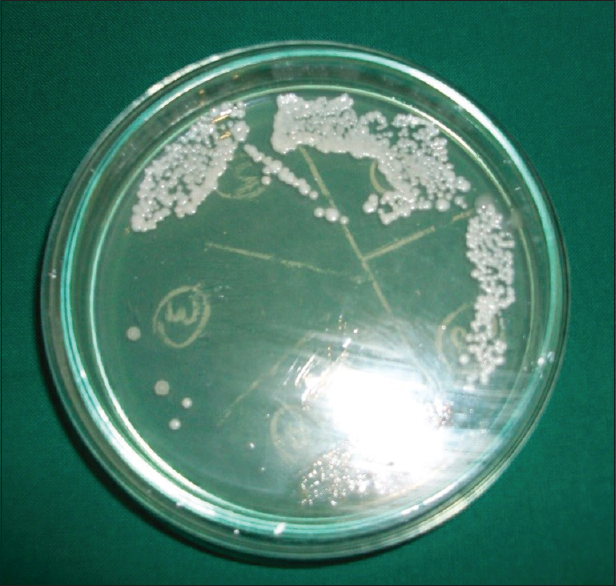 The plates were then incubated at 37°C for 48 h. After 48 h of incubation, the growth of Candida was identified by the smooth, white or creamy colored buttery colonies [Figure 1]. The number of candidial colonies on each plate was counted and recorded. The values obtained from the various study groups were calculated using the Chi-square test to assess the nature of candidial growth between the three groups. Student's t-test was applied to evaluate the gender predilection with respect to age, PPBS, HbA1c values, and candidial growth in saliva and one-way ANOVA was used to determine the significance in age and PPBS among three groups. From the total of 75 patients included in the study, a total of 30 saliva samples had shown the presence of candidial growth. Out of 25 saliva samples collected from Group I (controlled diabetic patients), 11 samples showed the presence of candidial growth and out of 25 samples collected from Group II (uncontrolled diabetic patients), 19 samples showed the presence of candidial growth. 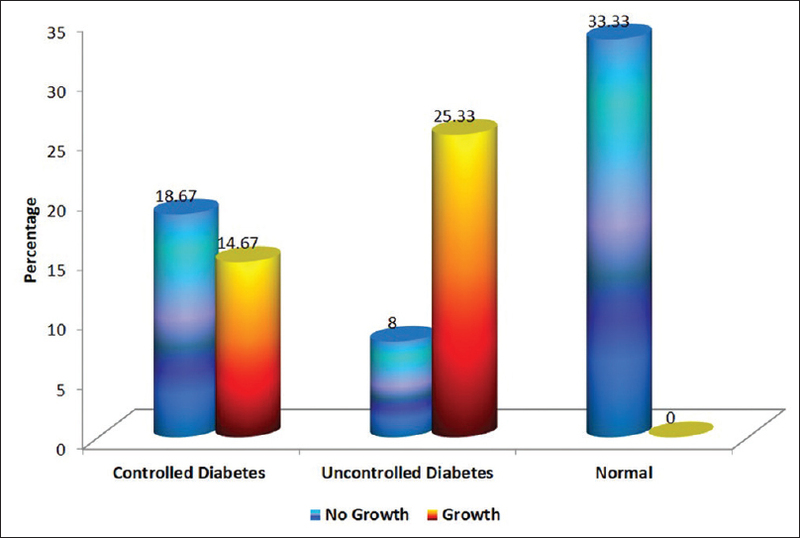 Samples obtained from Group III (non diabetic patients) showed no presence of candidial growth. The values obtained from the study groups were subjected to the Chi-square test to assess the nature of candidial growth between the three study groups. There was a significant difference in the nature of candidial growth between the uncontrolled and controlled group and normal participants (P < 0.001) as shown in [Table 1] and [Figure 2]. The nature of candidial growth was also assessed between the uncontrolled and controlled group and was found to be statistically significant with P < 0.021. Student's t-test was used to evaluate the gender predilection with respect to age, PPBS value, HbA1c value, and candidial growth in the saliva of uncontrolled and controlled diabetes. In Group I (controlled diabetic patients), although no statistical significance was observed in any of the parameters, the PPBS and HbA1c had shown an increased mean value in males when compared to females. The colony-forming unit (CFU) mean value was found to be increased in females (2.90) when compared to that of males (1.20). In Group II (uncontrolled diabetic patients), no statistical significance was observed with respect to age to any of the above-mentioned factors. The PPBS mean value for females was found to marginally higher than males while the males showed a higher HbA1c % when compared to females. The mean value of CFU was found to be increased in males (41.93) when compared to females (37.50). The CFU mean values obtained from Student's t-test in Group II were found to be 40.16, which were shown to be significantly higher when compared to the mean value of Group I which was 1.88. The computed values were found to be statistically significant [Table 2]. The one-way ANOVA test was applied to determine the statistical significance in mean score values in age and postprandial glucose values among the three groups. The mean value with regard to age in Group I (controlled) was 55.92. In Group II (uncontrolled), the mean value is 56.24 and in Group III, (normal) it was 50.64. The mean difference is not statistically significant among the three groups with P = 0.102 as shown in [Figure 3]. The normal oral flora comprises more than 700 microbial species of bacteria, virus, and fungi. The Candida species form the normal commensal fungi component, and its activity is regulated by many intrinsic and extrinsic factors. The pathogenic nature of Candida has been correlated with various systemic conditions, which in some manner, affect the immunity of the patients. Moreover, the enzymatic activity of C. albicans isolates obtained from type 2 diabetes is much higher than normal patients. Given the favorable conditions, Candida tends to achieve sufficient growth and activity, and it is for this reason considered an opportunistic infection., Diabetic patients are predisposed to higher candidal carriage in oral cavity due to their poor glycemic control. Several methods are employed in screening and evaluating the glycemic control, among which glycosylated hemoglobin HbA1c proves to be one of the reliable and recommended investigation methods as HbA1c is directly related to the rise in blood glucose over an interval of time. Another advantage is HbA1c values are not influenced by diet, therapy, physical activities, meals, and patient cooperation at the time of testing. Blood glucose of 120 mg/dl is approximately equivalent to 6% of HbA1c value which reflects an efficient long-term glucose control. Any value of blood glucose above 120 mg/dl reflects a fair to poor glycemic control. HbA1c is not used as a diagnostic study for diabetes because of lack of standardization of test procedures and overlapping values between normal and diabetic patients and serves solely to access glycemic control over 6–12-week periods. In the present study, the patients were investigated for postprandial blood glucose to determine the current blood glucose level serve as a diagnostic test. While glycosylated hemoglobin HbA1c was used to evaluate the glycemic control over 3 months to evaluate the association of glycemic control and oral candidial carriage in diabetic patients. In the present study, the candidial carriages in the saliva of uncontrolled diabetic patients were found to be higher when compared to the controlled group of diabetic and nondiabetic patients, and similar findings observed by other studies. The mechanism suggested for increased candidial colony could be attributed to the quantitative and qualitative production of saliva. Hyposalivation seen in diabetic patients can be possibly related to polyuria and also the substitution of normal functioning gland tissue by adipose tissue in major salivary glands. Thereby, growth of Candida species in the oral cavity is favored due to decreased production of saliva and the consequential reduced immunological activity of saliva. Another suggested mechanism for the prevalence of oral Candida in uncontrolled diabetic patients when compared to controlled diabetic patients, whereby the accumulation of sugar in tissues favors growth and proliferation of fungus as was observed in the coated tongue of uncontrolled diabetic patients in their study. The high level of salivary glucose can increase candidial adherence to the buccal epithelial cells which form glycosylation products with the proteins in tissues. Thus, hyperglycemic episodes of uncontrolled diabetic patients can lead to the accumulation of glycosylation products which, in turn, increase the receptor for Candida. Other factors that may influence the candidial growth are decreased activity of neutrophils and decreased salivary flow rate as seen in diabetic patients. In the present study, similar findings were observed in the nature of candidial growth, wherein the saliva of uncontrolled diabetic patients showed significant higher candidial growth when compared to controlled diabetic patients. In the present study, age, postprandial glucose values, HbA1c values, and CFUs did not show any significance with relation to gender in controlled and uncontrolled diabetic patients. Similar findings were observed by several other studies. Although the results showed that there was no significant correlation between CFU and gender in both diabetic groups, the candidial carriage was found to be increased in females of controlled group while males showed the predilection for candidial growth in uncontrolled diabetic patients group. Saliva is a unique fluid and used as a diagnostic medium. The analysis of saliva, such as blood-based analyses, has two purposes: the first, to identify individuals with disease and second, to follow the progress of the affected individual under treatment. Diabetes mellitus is a growing public health concern and common metabolic disease worldwide. Diabetes mellitus can predispose patients to various opportunistic infections and is related either directly or indirectly to the glycemic control. As the oral fluid, often called the “mirror of the body,” is a perfect medium to be explored for health and disease surveillance. The oral biofluid is readily available through noninvasive collection is helpful to monitor systemic diseases and conditions. Almost, anything measured in blood can be measured in saliva. The advantage of easy collection, storage, transport, low cost, sufficient and quantities for analysis, reduces anxiety and discomfort, does not clot, less invasive, less expensive, less risk, and procurement of repeated samples makes the saliva superior in diagnostics. Discrete lesions can begin as benign colonization as a result of increased candidial carriage which in time can progress to pathological overgrowth. As oral candidial carriage may be increased in uncontrolled diabetic patients, dentists should be aware of the risk of oral candidiasis in uncontrolled diabetic patients. In sustained diabetic patients, there is increase in the deposition of advanced glycation end products which hamper the normal homeostatic transport across the membrane resulting in higher production of vascular endothelial growth factor, which adds on to the microvascular complications of diabetes. The presence of oral manifestations in patients of diabetes mellitus indicates poorly controlled glycemic status and requires evaluation to detect long-term complications. Mucosal disorders such as oral candidiasis, in diabetes mellitus patients, primarily occur due to chronic immunosuppression and diabetes associated hyposalivation. There is a proportional increase in the incidence of oral candidiasis with hyperglycemia observed in uncontrolled diabetes. Apart from these, the commensals residing on the surface of oral mucosa are maintained in a state of hemostasis. The balance is sustained between the virulent potential of microorganisms and the inflammatory and phagocytic activity of neutrophils, lymphocytes, and macrophages. It is when the fungal load exceeds the immunomodulatory threshold of the oral mucosa along with contributory factors such as dentures which act as candidial reservoirs that the disease manifests itself. There is a threshold for the amount of C. albicans that is tolerated by the host with the alteration in the innate-mediated immunity of the host, and the invasion of the Candida from superficial lining to underlying layers has extensively utilized for identification and detection by pattern recognition receptors present on the surface of microbes such as the established toll-like receptors, the C-type lectin receptors, and the nod-like receptors. The immunomodulatory activity is performed neutrophils, macrophages, natural killer cells, and certain lymphocytes (CD4+, CD8+ T-cells) that are recruited from the proximity blood vessels as well the inherent nonkeratinocyte defense cells in oral mucosal linings. The direct antifungal activity includes the neutrophil cidal activity on the organisms and the clearing mechanism of macrophages by phagocytosis. These defense cells also signal lymphocytes to produce antibodies by secretion of chemotactic factors, cytokines, and antigen-presenting factors. These defense mechanisms prevent the invasion of the candidial hyphae from the superficial lining to underlying spinous layers of oral mucosal, particularly of the nonkeratinized mucosa. The volume and density of saliva form a regulatory and dense mechanism not only against Candida but also other pathogenic organisms. Hyposalivation observed in diabetic patients is due to reduced salivary gland function due to fibrosis causing increase in density and along with polyuria attributes to the reduced volume of overall reduction in saliva secretion. The impaired immune function of defense cells, hyposalivation, and the hyperglycemia each by itself contribute to the prevalence of oral candidiasis in diabetes mellitus. Diabetes Mellitus can predispose patients to opportunistic oral infections such a oral candidiasis caused by Candida. Beginning as a benign asymtomatic colonization, these organisms with a favorable habitat can progress to a pathological overgrowth. Dentist should be aware of such factors that can predispose patients with type 2 Diabetes Mellitus and provide a holistic treatment that cater to the dental needs and also at the same time prevent the occurrence of such infections. Greenberg MS, Glick M, Ship JA. Burket's Oral Medicine. 11th ed. Hamilton, Ontario:B.C. Decker Inc; 2008. p. 509. Seshiah V, editor. A Handbook on Diabetes Mellitus. Chennai: Diabetes Education and Research; 1997. p. 18, 207. Nanci A. Ten Cate's Oral Histology. 7th ed. St. Louis: Mosby; 2008. p. 291. Torres SR, Peixoto CB, Caldas DM, Silva EB, Akiti T, Nucci M, et al. Relationship between salivary flow rates and Candida counts in subjects with xerostomia. Oral Surg Oral Med Oral Pathol Oral Radiol Endod 2002;93:149-54. Salerno C, Pascale M, Contaldo M, Esposito V, Busciolano M, Milillo L, et al. Candida-associated denture stomatitis. Med Oral Patol Oral Cir Bucal 2011;16:e139-43. Bhat V, Sharma SM, Shetty V, Shastry CS, Rao V. Extracellular enzymes of Candida albicans and their role in development of denture stomatitis – A review. JIADS 2011;2:26-31. Nejad BS, Rafiei A, Moosanejad F. Prevalence of Candida species in the oral cavity of patients with periodontitis. Afr J Biotechnol 2011;10:2987-90. Samaranayake L. Commensal oral candida in Asian cohorts. Int J Oral Sci 2009;1:2-5. Rose L, Kaye D. Internal Medicine for Dentistry. 2nd ed. Philadelphia: Mosby; 1990. p. 1117. Shrimali L, Astekar M, Sowmya GV. Correlation of oral manifestations in controlled and uncontrolled diabetes mellitus. Int J Oral Maxillofacial Pathol 2011;2:24-7. Gupta S, Kumar A. 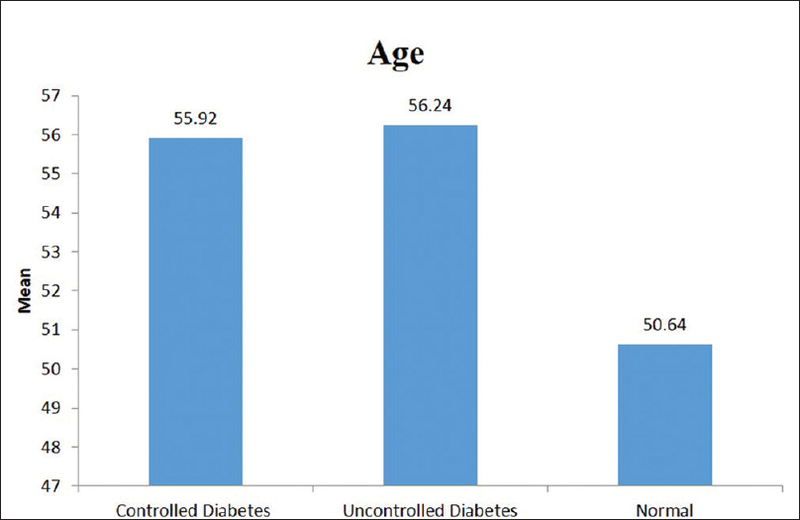 A comparative study on oral manifestations of controlled and uncontrolled type 2 diabetes mellitus in South Indian patients. J Indian Acad Oral Med Radiol 2011;23:521-6. Darwazeh AM, Lamey PJ, Samaranayake LP, MacFarlane TW, Fisher BM, Macrury SM, et al. The relationship between colonisation, secretor status and in vitro adhesion of Candida albicans to buccal epithelial cells from diabetics. J Med Microbiol 1990;33:43-9. Streckfus B. Salivary glands and saliva: Saliva as a diagnostic fluid. Oral Dis 2002;8:69-76. Segal A, Wong DT. Salivary diagnostics: Enhancing disease detection and making medicine better. Eur J Dent Educ 2008;12 Suppl 1:22-9. Bajaj S, Prasad S, Gupta A, Singh VB. Oral manifestations in type-2 diabetes and related complications. Indian J Endocrinol Metab 2012;16:777-9. Mauri-Obradors E, Estrugo-Devesa A, Jané-Salas E, Viñas M, López-López J. Oral manifestations of diabetes mellitus. A systematic review. Med Oral Patol Oral Cir Bucal 2017;22:e586-e594. Gleiznys A, Zdanavičienė E, Žilinskas J. Candida albicans importance to denture wearers. A literature review. Stomatologija 2015;17:54-66.